Back in August, wonderful mum and I did a workshop with the very talented Katie Almond (go and check her out) at Debbie Bryan, a wonderful handmade shop with a tea room which hosts workshops in a variety of disciplines. If you've clicked that link to see Katie's work (and you really should), you will know it was a day of ceramics. 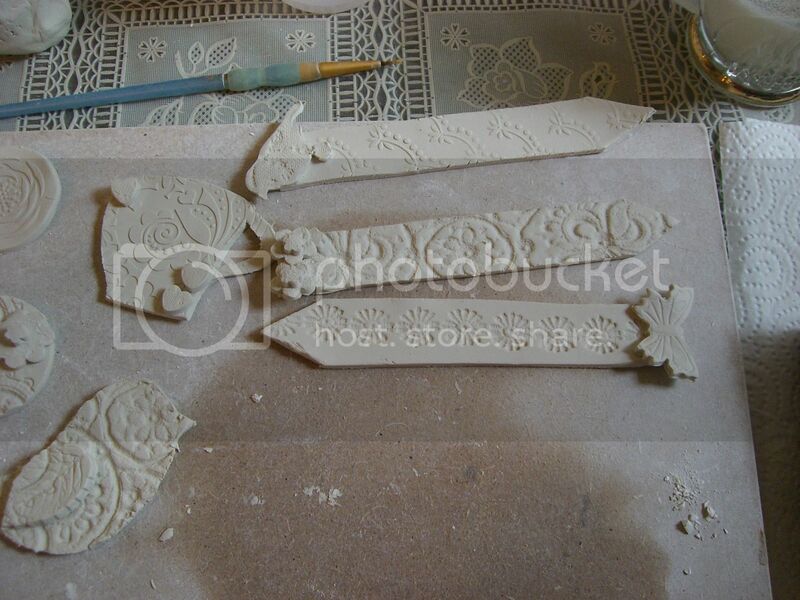 We worked with porcelain clay, rolling it out and imprinting various designs and patterns on it. We used rubber stamps, lace, trims and paper cut outs to make a variety of different patterns. The workshop was to make the plant pokes you see on the right, though my plan was to use them as bookmarks as I killed off all our plants years ago. We also made some brooches. We cut them out using paper templates and used punches to create different shapes. You can see I used lace quite a lot on my imprints. Then we painted them with under glazes. I thought they looked terrible at this stage, but it was hard to tell how they'd turn out as glazes don't work the same way as paint. Katie took them back to her studio to fire them and we got to pick them up a couple of weeks later. 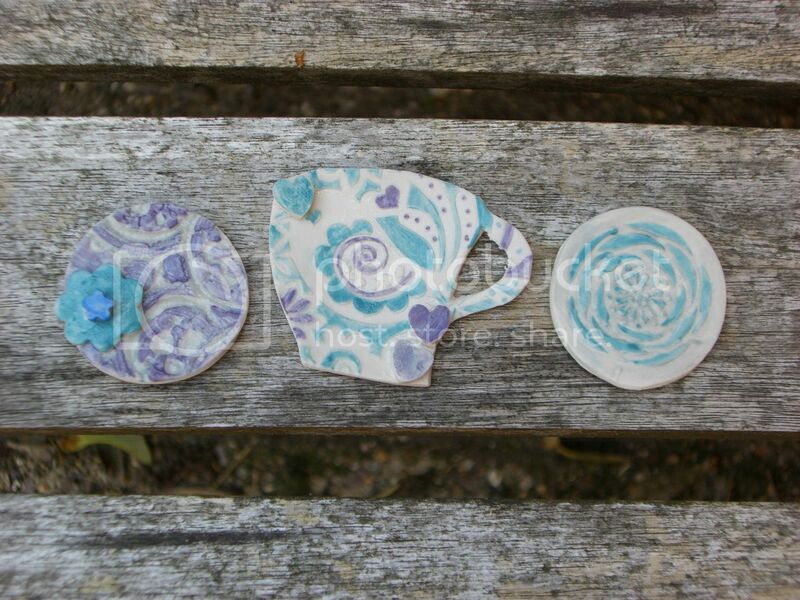 This is them after firing. As you can see, they don't look brilliant and they're too thick for bookmarks. I think I did better with some of the brooches though. I really wish I'd had more time to paint this one so that I could pick out the pattern better. I should have done the wing in the same dark blue as the flower round his eye. I'm really happy with the one in the middle. The one on the left doesn't look too bad in this photo so I might make that into a brooch too. The one on the right didn't work. The grey paint I'd used just doesn't work with the blue. I could paint it with ceramic paints to try to save it. Wonder if that would work on the plant pokes too? Either way, we had a great day and I went home daydreaming about finally owning a kiln one day! You've been doing some lovely things recently. I think these worked well - they are a first attempt, after all. Until you get your kiln (!) 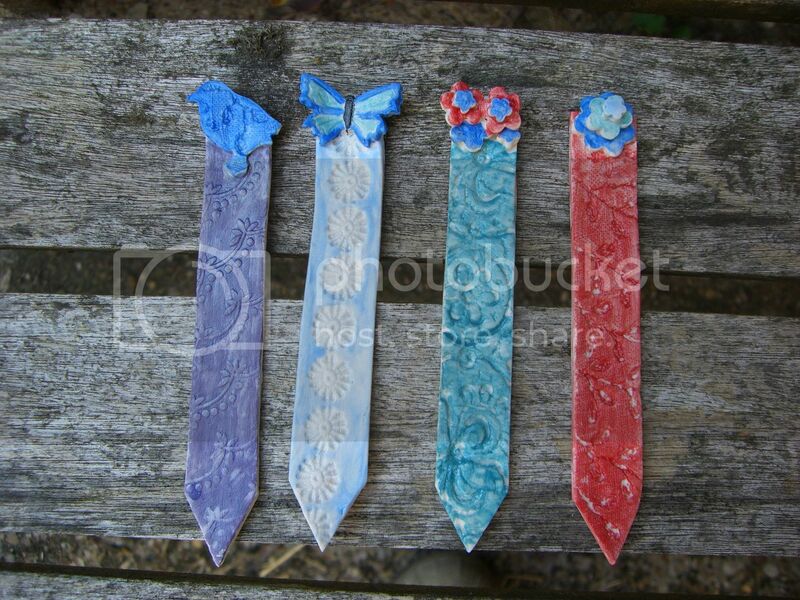 you could also make these using polymer clay - the texture at the end would be different, but you could practise to your heart's content! 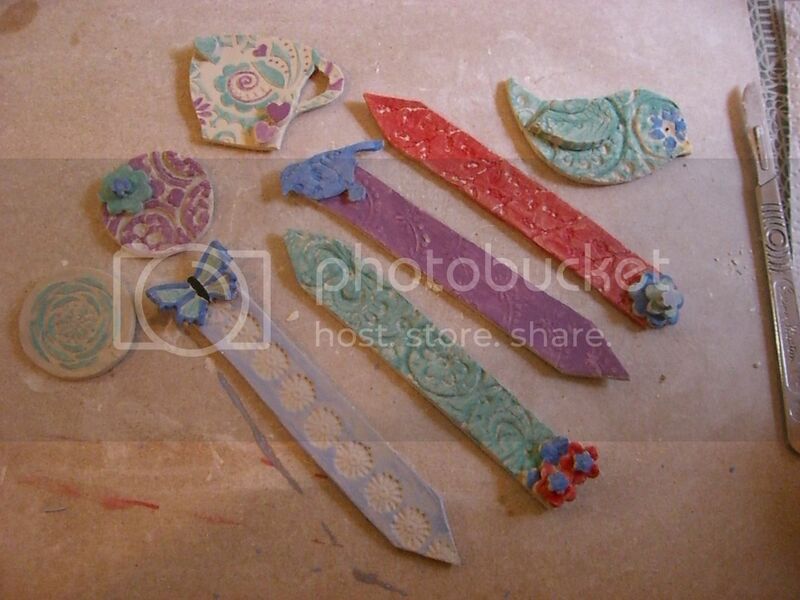 I may have to try doing just that soon because I haven't done any polymer clay work for ages! Glazes do take some mental adjustment to manage, but once you've made the adjustment, it's surprising to see what you can do! That sounds like a fun class - those would make great ornaments too! 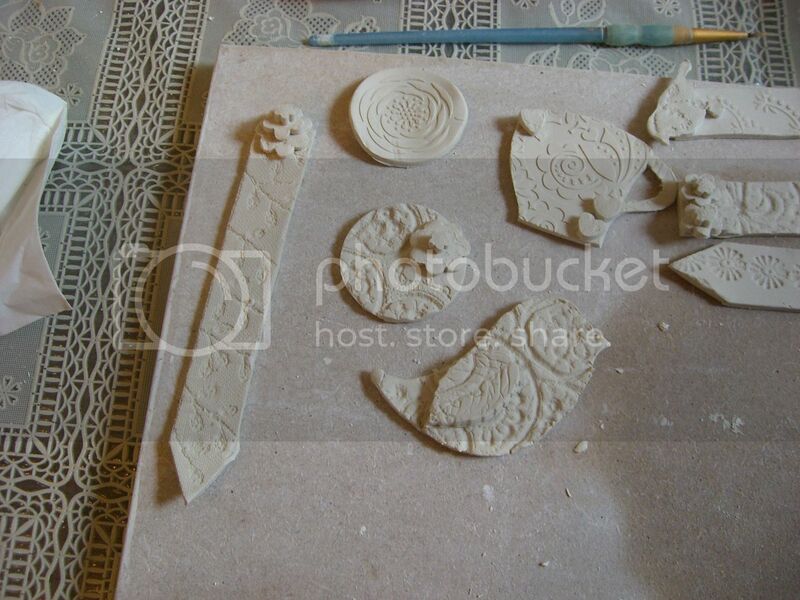 I tried ceramics, once, in school, many....many years ago. I've always been fascinated with it. 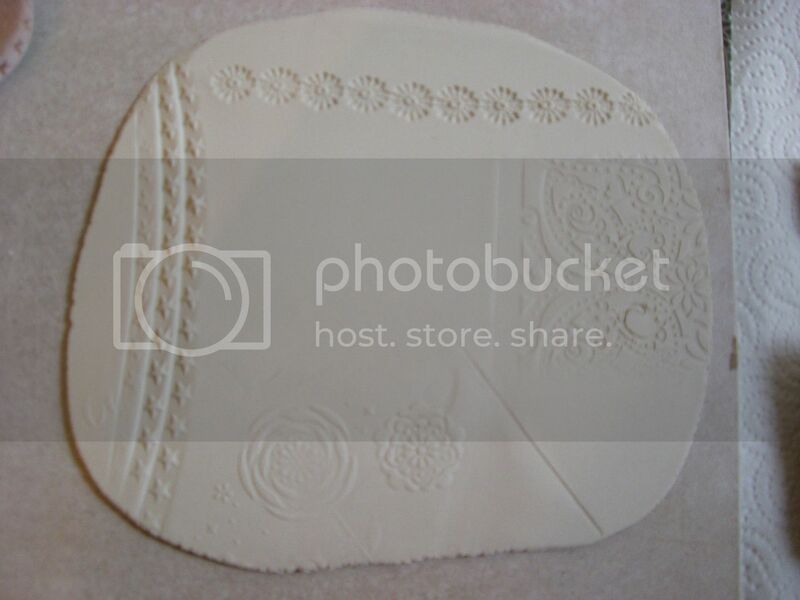 Great technique ideas for ceramic or even air dry clay. another skill you have mastered I am impressed with all these. 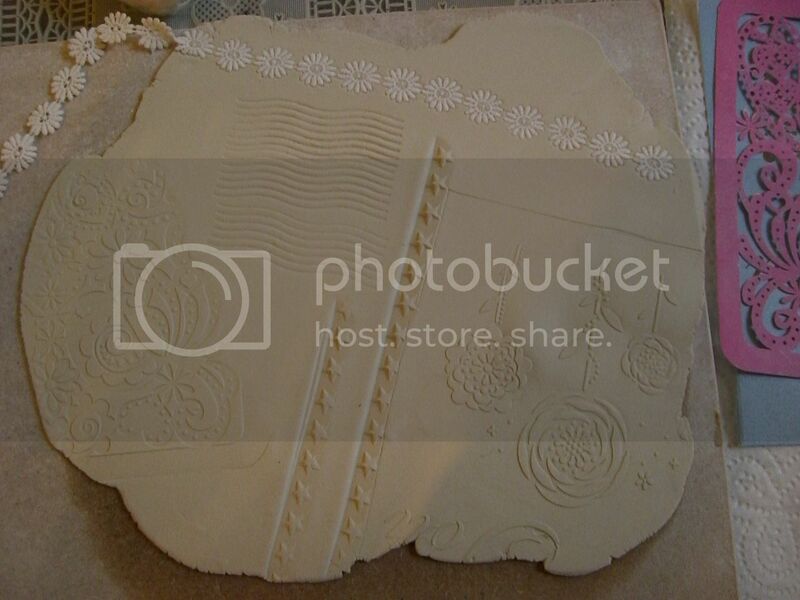 I am visiting you from ChristineB's blog! Nice to meet you! I joined a group for ceramics about 5 years and enjoyed what I accomplished there. I love the ceramic shapes you have made, they are so imaginative! My ceramics were from moulds. We had to file away the joins until they were smooth before we could start painting them! I painted a couple of large vases but most of the moulds were items for children to work on, and that was why I stopped! I was told I wasn't putting the paint on thick enough, apparently it can take a lot of paint to get the colour showing properly - more than I thought, anyway! I wanted my colours to look pale and didn't listen, but wish I had. 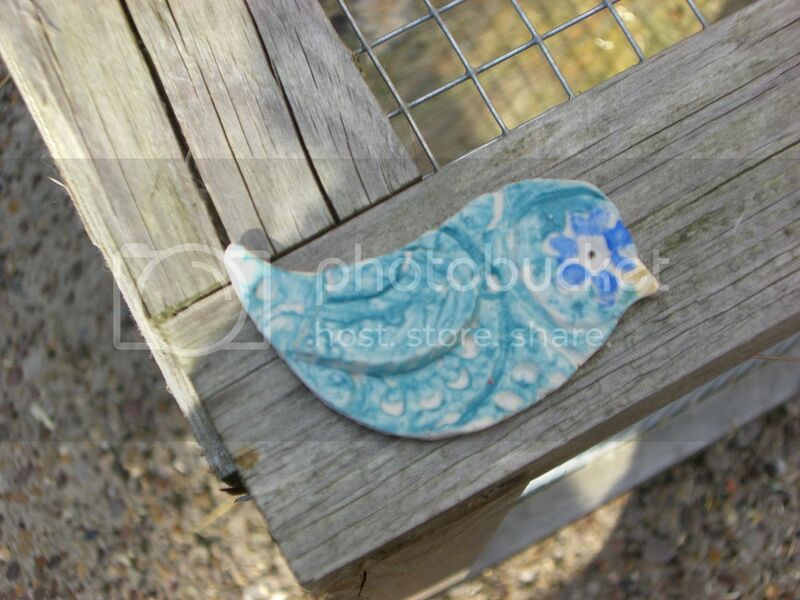 I think it is possible to paint it again and put it back in the oven, but I'm no expert! Will you be doing any more? Ooh, I love this workshop and the things you made!